Artfuly Designed. Creative and Fresh. The Flower Shoppe of Eric's has provided quality designs and fresh arrrangements for over 50 years to the town of Reading and surrounding areas. 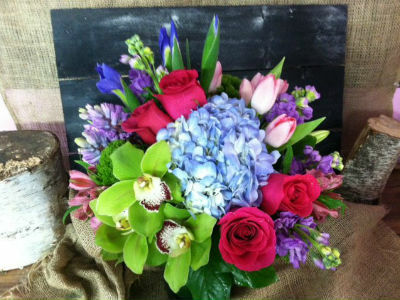 We take pride in creating the perfect floral arrangement and gift for each customer. Our goal is to exceed your expectations with attention to detail and exceptional service. Your unique style and desired message will be conveyed through each floral design. My Name is Rachel O'Neil and my love for flowers started the day I walked in to Eric’s Greenhouse March of 1999 and started an after school job. Over ten years, some wonderful opportunities and plenty of arrangements later, my dream of owning my own floral shop has become a reality. I am thrilled to have the opportunity to provide quality service and flowers to my hometown and surrounding areas. *Our shop is open from 9:00 AM to 4:00 PM on Monday and Tuesday, 9:00 AM to 5:00 PM Wednesday, Thursday and Friday and from 9:00 AM to 3:00 PM on Saturday. **During peak Wedding Season, the shop may close early on Saturdays for event delivery and set up. Please call in the morning for same day delivery. ** Our shop is closed on Sundays, with the exception of funeral or event deliveries. To help assure on-time delivery during the busy holiday season, place your order at least 1 day prior to the following major holidays: Thanksgiving Day, Christmas Day, New Year's Day, Valentine's Day, Easter, Administrative Professionals Week, Mother's Day, Memorial Day, Father's Day, Independence Day and Labor Day. Our shop will always be closed on the following holidays: Thanksgiving Day, Christmas Day (and the day after christmas), New Year's Day, Independence Day, Memorial Day, and Labor Day. Our shop serves the following areas in Massachusetts: Lynnfield, North Reading, Reading, Stoneham, Wakefield, Wilmington and Woburn. If you have any questions or need more information, please contact us by e-mail at hello@racheloneilevent.com or call us directly at (781)944-0547. We're always here to serve you and make your flower-sending experience a pleasure.